The Tri-Parish offers parishioners and visitors alike the opportunity to make donations through the secure and convenient links below. Online donations are credited to your year-end tax statement (unless made anonymously), and you can easily keep track of your gifts with just one click. 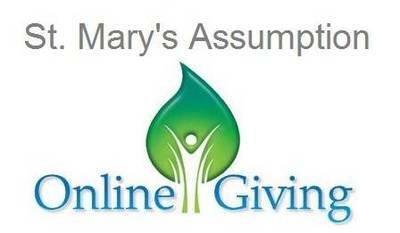 To sign up and start giving online, click on the image labeled with your parish's name below. Instructions for setting up an account can be found HERE. If you are planning to contribute online exclusively, please contact the Central Office at 715-672-5640 to have your envelope delivery suspended. Did you know you can use your Online Giving account to support our Catholic school? ​Just designate your donation for "School Support," and it enters the school's general fund! ​Have a child attending Assumption or Noah's Ark? ​You can also pay for tuition and hot lunch through your Online Giving account. Click on the image with your parish name to make a donation.